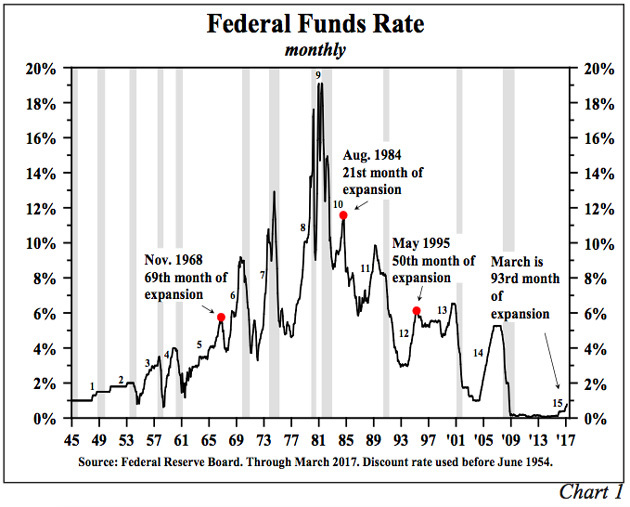 Lacy Hunt and Van Hoisington kick off their Q1 “Review and Outlook” – today’s Outside the Box – with a bang, calling our attention to the fact that in 80% of the 14 Federal Reserve tightening cycles since 1945, a recession ensued, and the Fed managed to keep the Good Ship Economy off the rocks just three times. 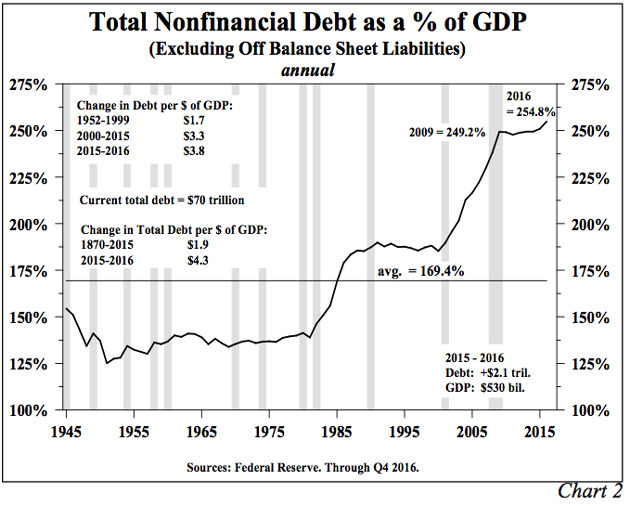 And, oops, we’re in the 93rd month of the current expansion, farther out to sea than we were those three times when the Fed brought us safely in to port, in 1968, 1984, and 1995. [T]he last ten cycles of tightening all triggered financial crises. In conjunction with the non-monetary determinants of economic activity (referred to as initial conditions), monetary restraint served to expose over-leveraged parties and, in turn, financial crises ensued. Lacy and Van then proceed to enumerate four major ways in which those “initial conditions” are different (read: scarier) today than they were in any of the previous 14 tightening cycles. Got your life jacket ready? Lacy will be helping us hand them out at this year’s Strategic Investment Conference, May 22–25 in Orlando. And you’ve heard me say it before, but I’ll say it again: The President could do far worse than appointing Lacy Hunt to fill one of the two empty Fed governor seats. I’ll tack on just a brief personal note here. I am actually in a car, writing on my iPad as Shane drives us to the Buck Institute. The new president and CEO of the Buck is Eric Verdin, and when he read that I was in Sonoma he asked us to come by for lunch and conversation. The Buck is the center of the very interesting spider web that is the anti-aging research world. They see everything, and I am honored to get some of his time and a chance to catch up on the latest news in the fight on aging. It has been a great few days in Sonoma, with so many friends, both old and new. I actually did play nine holes of golf and only lost two balls, LOL. It made me realize I need more downtime. Someday I will get around to that. We are starting to introduce the new Mauldin Solutions Smart Core Portfolios to advisors and brokers, and soon we will be making them public to everyone. I am really encouraged by the level of interest we are seeing. You have a great week. We fly back tonight from a rainy California to a hopefully sunny Texas, even if it will be late at night. 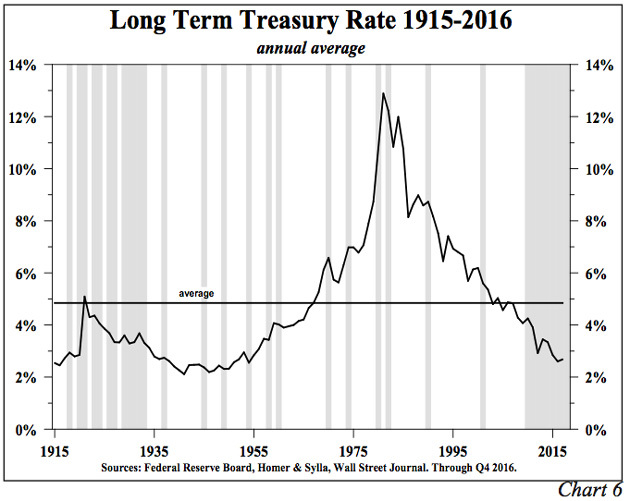 The Federal Reserve has initiated the fifteenth tightening cycle since 1945 (Chart 1). Conspicuously, in 80% of the prior fourteen episodes, recessions followed, with outright business contractions being avoided in just three cases. What is notable today is that the economy is in the 93rd month of this expansion, a length of time that is well beyond periods in prior expansions where soft landings occurred (1968, 1984 and 1995). 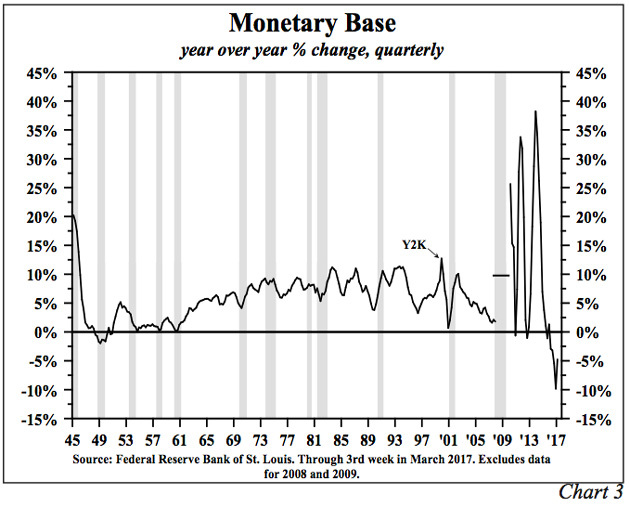 This is relevant because the pent-up demand from the prior downturn has been exhausted; thus, the economy is extremely vulnerable to a shock, which could lead to recession. 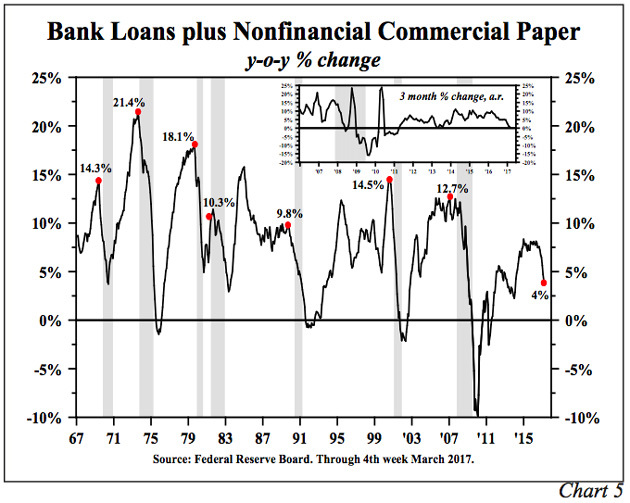 Regardless of whether there was an associated recession, the last ten cycles of tightening all triggered financial crises. In conjunction with the non-monetary determinants of economic activity (referred to as initial conditions), monetary restraint served to expose over-leveraged parties and, in turn, financial crises ensued. Beginning in 2015, large banks as well as banks with substantial foreign exposure are required to have a 100% or greater “liquidity coverage ratio” (LCR). This means the banks must hold an amount of highly liquid assets (such as reserve balances at the Federal Reserve Banks and Treasury securities) equal to or greater than the difference between their cash outflows and inflows over a 30-day stress period. Thus, excess reserves are irrelevant to the money creation process if the reserve balances are needed to achieve a 100% LCR. 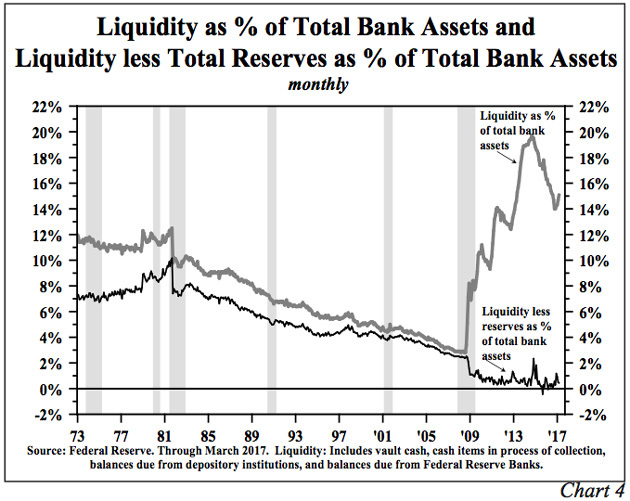 In line with the decline in excess reserves, there has been a dramatic reduction in bank liquidity, which has fallen nearly 17% (Chart 4). This reduction brings bank liquidity much closer to its LCR, altering bank management practices. Based upon an examination of all the monetary indicators closely linked to the policy rate and the reserve aggregates, the probability exists that the Fed, with three small increases in the federal funds rate, has now turned the money / credit creation process negative. April 26, 2017, 6:31 p.m. I have just one question. Given todays proposed tax law changes, corporations just might be repatriating north of $1 trillion to the USA. What, if any impact, might this have on the equation?